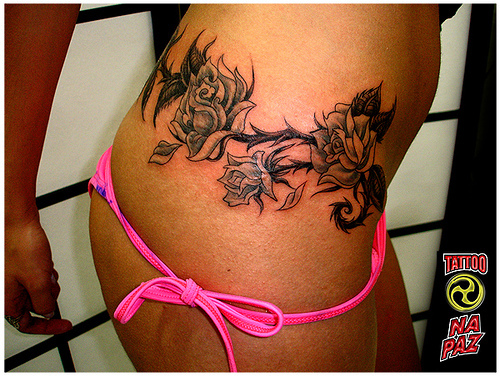 Temporary tattoos on certain body parts, such as dangling chain in the thigh, is expected to be the trend in 2011. For some people, tattoos are considered as a taboo. The art of body painting with ink sometimes be a sign of a hard lifestyle. In fact, it indicates the macho's. However, the more modern, tattoo considered an art that is also favored by most women, even get into the fashion industry. International fashion houses showcase their designs at once with the design of temporary tattoo. Call it Rodarte, Jean Paul Gaultier, Chanel and even, they dress the models with current temporary tattoos to demonstrate their fashion collection for spring / summer 2011. It is said, was so much interested in temporary tattoos, Karl Lagerfeld decided to launch a line of temporary tattoos Chanel accessories. Reportedly, Chanel will issue this temporary tattoo collection in March in Europe at a price around 49 euros. There will be about 55 different tattoo designs that are marketed. Temporary Tattoos are actually a picture that is transferred and is the result of make-up design director, Peter Philips. Generally, tattoo image in the form of Chanel logo pictures, chains, flowers, and pearl necklace that can be placed in the thigh, calf, or wrist, that it will be interesting to wear "dress up" the body parts are generally not covered in the summer.